Probably the most stimulating book I have read on Irish migration to Britain was published over 60 years ago, namely J.A. Jackson’s The Irish in Britain (London, Routledge & Kegan Paul, 1963). Despite its age I find it retains a thought provoking freshness and raises questions about the migrant experience and the clash of identities and loyalties which, if anything, are more relevant than ever. Can you tell us more about the field of study that you are in? I’m a human geographer with a lifetime’s interest in questions of national identity, loyalty and the sense of belonging. This might well reflect the fact that I was born, brought up and educated in Northern Ireland, where these very questions lie at the heart of so much of political, social and cultural life there. Yes indeed! I ended up in some parts of Manchester which I scarcely knew existed until I started working on this topic. One of these is what was known as ‘Little Ireland’. This was the small Irish neighbourhood behind Oxford Road station written about by the sanitary reformer Dr. James Phillips Kay and by Friedrich Engels, who devotes several pages to it in his classic ‘Condition of the Working Class in England’. Engels went round the working class areas city with his partner the Irish born mill worker Mary Burns probably acting as his guide. It was only as I got into the research that I realised that in coming into the city by train I had unknowingly been skirting the fringes of this famous district for several years! Ironic that apartments in an area of Manchester once infamous for its poverty are now on the market for several hundred thousand pounds. The other fascinating part of the city I came to know well is ‘Angel Meadow’, sometimes known as ‘Irish Town’, off Rochdale Road. Despite being not as well known as ‘Little Ireland’ it was by far the largest and most long lived Irish district in the city. I examined it in detail using the 1851 census, mapped the results and walked the streets. Once you have looked at census material with its details of the individuals and families who lived there at a certain date you have a feeling that you are walking with ghosts every time you go there! Here too considerable redevelopment is under way. A final fascinating place I came to know well is the archive centre for Salford Catholic diocese at St. Augustine’s church, Oxford Road, presided over by Fr. Lannon, the archivist. It is a real treasure house and Fr. Lannon is a very fine gatekeeper – well informed, knowledgeable, and very helpful to serious researchers, both amateur and professional. Meeting and talking to the Manchester Irish. Many of them had fascinating stories to tell about their personal migrant experience and shared willingly. Some had vivid recollections of their family history not only in Manchester but back home in Ireland. They were able to bring alive some of the things I had read about and researched. It was also thrilling to make contact with those who had personal links with historic Irish personalities such as the Manchester Martyrs executed in 1867, Eamon De Valera the nationalist leader, Sir Dan McCabe, the Manchester Irish leader and Lord Mayor and Professor Eoin MacNeill who did so much for the Irish language. I was intrigued to discover that the founder of the ‘Manchester Evening News’, Mitchell Henry, was second generation Manchester Irish, as was John Dulanty, first Irish Ambassador to Britain after Ireland became a republic. It was equally fascinating to meet former Taoiseach Dr. Garret FitzGerald and have dinner with him after a brilliant lecture at the University and Presidents Mary Robinson, Mary MacAleese and Michael D. Higgins. President Higgins has links with the city, since he was a postgraduate at Manchester University in the late1960s, and I found to my surprise that he had read some of the articles I had written about the Manchester Irish! Getting started and meeting the deadlines! 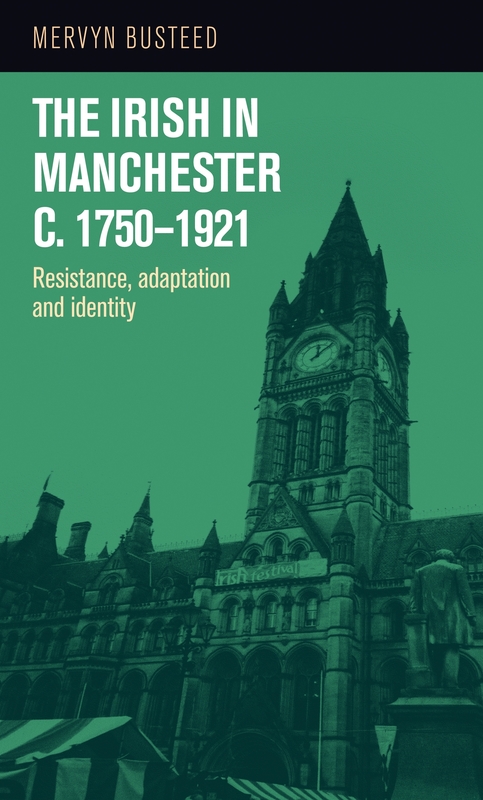 For quite a few years people had been telling me that whilst they appreciated the articles on the Manchester Irish which I had published in academic journals, they were expecting a book and where was it?! The greatest challenge was bringing together so much material gathered over many years, devising a theme and then selecting what should be written up – and, even more challenging, what should be left out because of lack of space! Delighted pleasure! A colleague made me a congratulatory card – I married her a year later! Given that I spent about 35 years in the university Geography Department, the fact that the book was very much centred on the city and there was a strong Irish list developing, MUP seemed the natural outlet. Irish President Michael Higgins has described MUP as ‘one of the great university publishing houses’ and he was right. I am looking into the role of the Manchester Irish in the revolutionary period 1916-23 and have already discovered some surprising things. 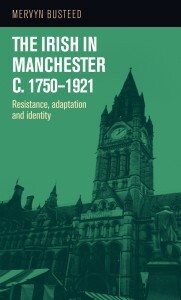 The Irish in Manchester c.1750–1921 by Mervyn Busteed is available now.